Stars: Saoirse Ronan, Laurie Metcalf, Tracy Letts, Lucas Hedges, Timothee Chalamet, Beanie Felsetin, Odeya Rush, Stephen Henderson, Lois Smith, Bob Stephenson, Jordan Rodrigues, Marielle Scott. Greta Gerwig is best known for her work as an actress working in the independent scene, especially in the quirky, low budget mumblecore comedies of Joe Swanberg and her collaborations with Noah Baumbach in films like Frances Ha, Mistress America, etc. Now she steps behind the camera for her solo directorial debut with this semi-autobiographical coming of age story loosely based on her own experiences growing up in Sacramento. 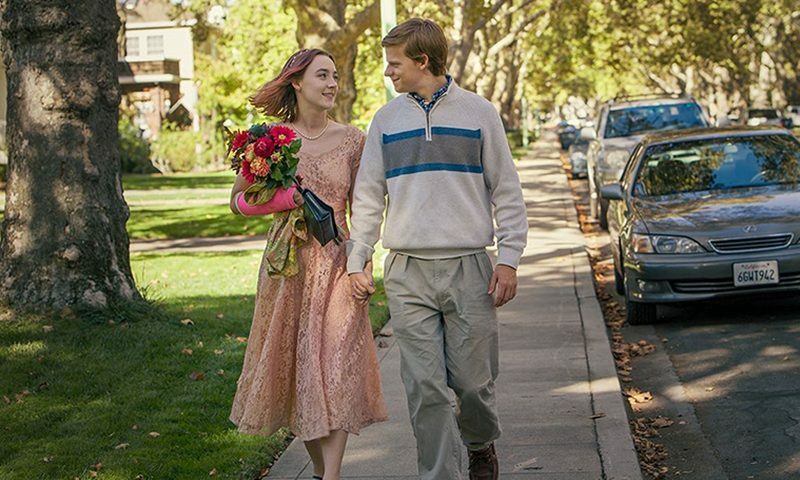 The sensitive and largely unsentimental Lady Bird is set in Sacramento in 2002 and follows Christine McPherson (played by Saoirse Ronan, from Brooklyn, etc), a somewhat precocious and rebellious and underachieving seventeen-year-old from an impoverished family, through her final year of high school. The film explores universal themes of identity, the pain and confusion of adolescence, freedom, responsibility, and troubled mother/daughter relationships, and is disarming in its honesty. Lady Bird is full of the usual tropes of the genre as Christine navigates the usual pitfalls of adolescence, the emotional minefield of high school, and a fractious relationship with her head strong mother Marion (Laurie Metcalf, from tv series Roseanne, etc), a psychiatric hospital nurse who works double shifts to support the family. Christine (who insists that everyone call her Lady Bird”) wants to escape her dreary life in Sacramento and head off to an Ivy League college, a dream that may well be beyond her. Marion meanwhile would prefer that she choose a community college closer to home. The two repeatedly clash, but soon come to realise that they have more in common than they would like to admit. And there is also a deep affection they share beneath the surface. Caught in the middle and trying to maintain an uneasy peace between the pair is her depressed, out of work father Larry (playwright Tracy Letts), a sympathetic figure who just wants her to attend the school of her dreams and be happy. Christine also clashes with her best friend Julie (Beanie Feldstein) when they both audition for a role in the school production of Stephen Sondheim’s musical Merrily We Roll Along. She also finds her first boyfriend in the sweet natured Danny (Lucas Hedges, from Manchester By The Sea, etc), who harbours a personal secret, and loses her virginity to Kyle (Timothee Chalamet, from Call My By Your Name, etc) the cool kid who plays in a band named L’Enfance Nue. He has a darker edge to him though. She also tries to make friend with the rich and popular Jenna (Odeya Rush), the school’s self-appointed queen bee, but her attempts to impress further drive a wedge between her and Julie. A deeply personal film for Gerwig, Lady Bird is a familiar coming of age tale, but it seems fresh and is grounded in a reality that will resonate strongly with its target audience. It has been one of the best reviewed films on the Rotten Tomatoes website. This marks an assured debut for Gerwig, who clearly has an ear for how her characters speak and her affection for them is obvious. The dialogue is sharp and biting and tempered with generous doses of self-deprecating humour. It has a similar acerbic edge and tone as last year’s Edge Of Seventeen. It’s little wonder then that she has become the first female director to be nominated for an Oscar since Kathryn Bigelow. Ronan delivers the performance of her career as the precocious and angst-ridden Christine, a character who clearly carries many of Gerwig’s personality traits. She is by turns endearing, annoyingly self-centred, cynical and upbeat and brings a prickly charm to her performance. This is a performance that demonstrates a maturity and assurance beyond her years. Tony award winner Metcalf is superb as the headstrong Marion and makes the most of her best role in years. She softens the rough edges of her character with a sympathetic, warm and empathetic performance. There is a great dynamic between the two that shapes their often heated but funny exchanges. Chalamet, who delivered a breakout performance in Call Me By Your Name last year, is given less to do her as the brooding and moody Kyle, while Hedges brings to his role the same sort of awkwardness that shaped his character in the Oscar winning Manchester By The Sea. Veteran Lois Smith brings a nice touch to her performance as Sister Sarah, the mother superior who offers Christine some sage advice, and Stephen Henderson (Fences, etc) brings warmth to his role as Father Leviatch, the kindly drama teacher. Bob Stephenson brings some wonderful touches of humour to his role as Father Walther, the sports coach who is brought in to take charge of the drama production late in the rehearsal process. The film is something of a love letter to Gerwig’s hometown of Sacramento, and cinematographer Sam Levy (a regular of Noah Baumbach’s films) has shot the film with a warm autumnal palette that suits the setting. There is a great soundtrack of hits from the era that also adds a nostalgic touch to the material.